(London) The bBC claims to be impartial, but, to be honest, I've noticed over the years that the bBC is a terrorist apologist (the bBC forbids the use of the term terrorist, as it is a loaded word). Yes, the news org which can bring you a news story as told to them by the Taliban, Hamas, or even ISIS, faster than these wankers can utter 'Allah Ackba', somehow are slow off the mark when it comes to terrorist attacks in France, England or, in the case of Israel, not even at all. Myself, disgusted at the pro-Islamic terrorist angle of the bBC, have subscribed to a blog which exposes the bias written into the DNA of the bBC. (Kind of helps when your religious editor is a Muslim). Then there was the Balen Report which looked into the anti-Israeli bias of the bBC and, guess what, the bBC has buried that report deeper than even the devil can get to it, and even the courts of the land have backed the bBC in not releasing that report. So it is no secret that the bBC isn't impartial like it claims to be. Which kind of explains this happy snap of a bBC Arabic reporter Assaf Aboud with a bunch of Syrian soldiers. The picture was apparently taken on Saturday morning in the Ramussa district of Aleppo, which regime forces retook from the rebels last week, re-imposing a siege on the rebel-held parts of the city in the east. 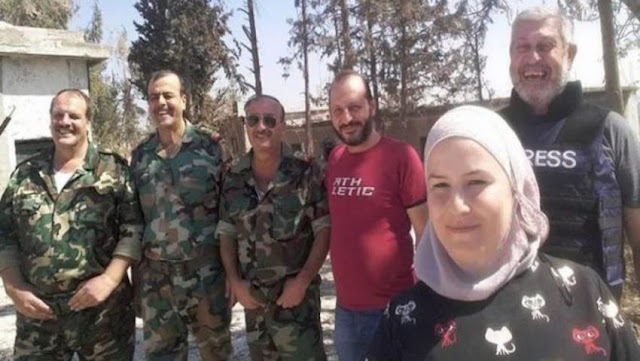 The picture with the officers of an army accused of war crimes and even genocide prompted Syrian journalists to demand the BBC take action against Abboud by sacking him. To many, the picture is a declaration of "alignment and loyalty." BBC Arabic has yet to issue a comment. Can you imagine the bBC's Middle Eastern J Bowen (aka Abu Bowen) doing likewise with the British Army or even the Israeli one? Nah, he would play the impartial line, but when it's Islamic despotic regimes or even Islamic terrorist orgs such as Hamas, Hezb-allah or even the Taliban then that's OK.
bBC reporter Assaf Aboud (far right) with his mates.